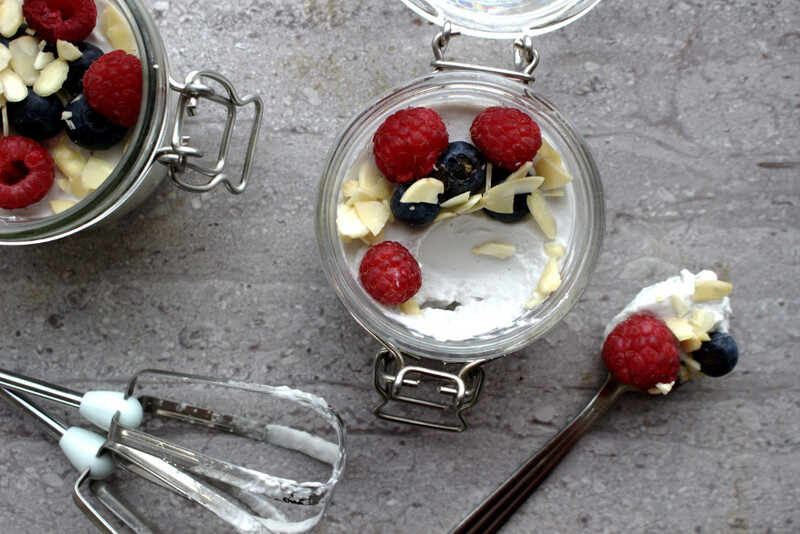 GLUTEN-FREE, GRAIN-FREE, REFINED SUGAR-FREE, DAIRY-FREE, PALEO & SPECIFIC CARBOHYDRATE DIET. Since I first made coconut cream a few months ago, I have pretty much been hooked. It is so easy to whip up (pardon the pun!) and tastes so “creamy”. 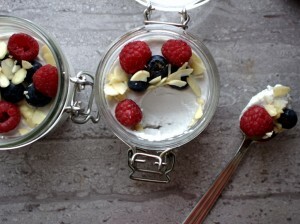 I like to serve this Coconut Cream with Fresh Fruit in little ramekins or small jars. My daughter loves this. She always insists on licking the spoons! Coconut cream is so versatile. It tastes great with fruit, nuts and honey as in this recipe but it also works great as a cake icing. To see a recipe for my occasion cake with coconut cream icing, click here. To make the best coconut cream you should use only full fat coconut milk. There should be absolutely no additives including gums, stabilisers or added sugar. 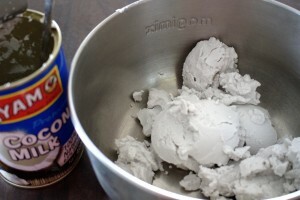 To make the coconut cream, simply refrigerate the can of coconut milk upside in the fridge overnight. The next day, take out the can and open it right side up. Scoop out the hard flesh of the coconut which should now be at the top. Stop when you get to the liquid milk. This can be reserved for smoothies. 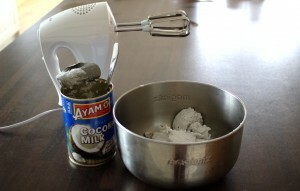 Then simply whip with an electric mixer on high speed until you reach the consistency of whipped cream. I’m always looking for snacks ideas to eat and I like setting myself the challenge of creating new ones. Most of all, I love spending time with my daughter in the kitchen. Now anytime I am cooking or baking she pulls up her chair and insists on helping. It’s such a fun way to spend our days off and I take so many photographs of her stirring, mixing and licking 🙂 which I know I’ll treasure forever. She regularly raids my food blog props to play with in her wooden kitchen. I’ve literally lost count of how many plastic spoons and silicone moulds she has robbed from me at this stage. When she looks at me with those eyes and asks if she can borrow something, how could I possibly resist? 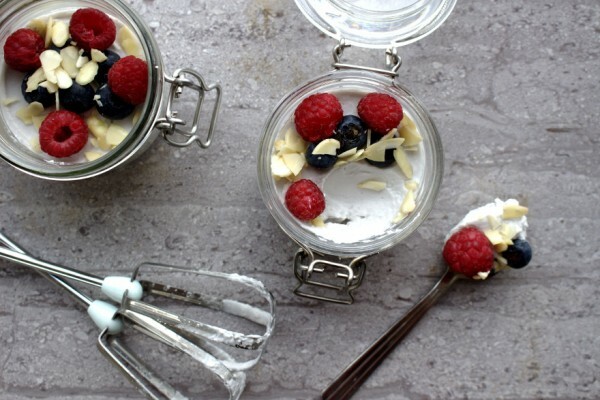 A delicious dairy-free treat to enjoy with fresh fruit, raw honey and nuts. Take the chilled can of coconut milk out of the fridge and turn the right side up. Scoop out the hard flesh of the coconut at the top and reserve the liquid milk for use in soups or smoothies. Add the vanilla extract and whip using an electric mixer on high speed for a few minutes until you have what resembles whipped cream. Arrange the whipped coconut cream into ramekins and decorate with fruit, nuts and raw honey.